Reporter Dean Griffin visited UCSD and spoke with Calit2 researcher Mike Sailor about tiny sensors to detect biohazards. "What you would like," Sailor told the TV interviewer, "is to have a [testing] lab shrunk down to the size of a chip and place it everywhere and it would only cost a few pennies." The paper's Sacramento correspondent, Bill Ainsworth, interviewed Calit2 director Larry Smarr at the Digital Government Conference in Sacramento, and filed this report on the institute's efforts to tap into technology in response to security threats. According to the article, many of the institute's research projects "can also help government officials prepare and prevent disasters." In a special print and online issue, the magazine asked Calit2 director Larry Smarr to answer three questions, including the greatest threat ("biological terrorism") and issues that will define the future ("converging exponentials of bio-X, nanotech, and information technologies/telecommunication"). 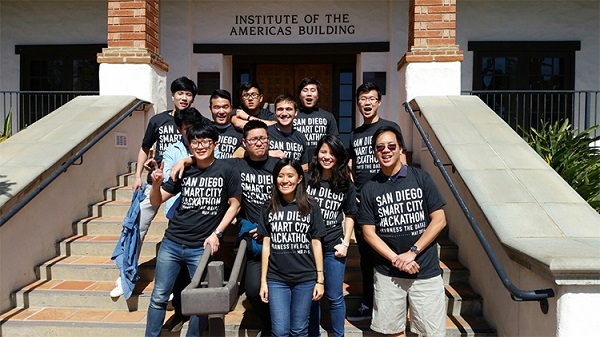 "To see where technology will take us tomorrow, enroll at UC San Diego today," writes Quentin Hardy, who spent a day at Calit2 to report this profile of the institute and director Larry Smarr. Noting Calit2 plans to deploy high-speed wireless networks, supercomputers and nanotechnology labs, the magazine reports "the idea is to build the high-tech environment most of the world won't see for another decade." Peggy Albright reports that UCSD's Bill Griswold, supported by Calit2, is "leading an interdisciplinary team of researchers… to examine how location information might be used to promote spheres of commonality among students, faculty, staff and visitors to campus." Reporter Jennifer Davies quotes Calit2 layer leader Mohan Trivedi as saying his research lab at UCSD is working on technology similar to Qualcomm's for use in automobiles and trucks: "There's a critical need for these types of security systems, Trivedi said, because 58 percent of all terrorist attacks are against the transportation infrastructure." Calit2 director Larry Smarr writes in the newspaper's special report on Next Generation Networks: "One early activity of Calit2 is to create a variety of prototypes of early warning systems coupled to a disaster response information and telecommunications system." In a piece about new medical devices for deployment inside the body, reporter Scott Horsley spoke with Calit2 director Larry Smarr about the future of wireless sensors to monitor health conditions. In a feature about the impact on innovation from the downturn in the economy and high-tech stocks, Carolyn Duffy Marsan reports that "California's CalIT2 project… is building test beds for emerging optical and wireless technologies." She quotes director Larry Smarr saying, "In spite of a meltdown in the stock market and huge debt loads among wireless carriers in Europe, we have really seen no major backing away by industry from its support for our institute.